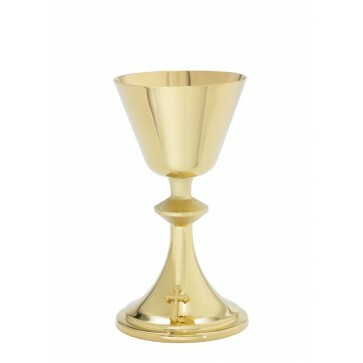 24KT Gold Plate Chalice. Height 7 _" with 5 _" scale paten. Cup diameter 3 7/8". A combination of textures sets the Chalice Brushed Finish Node apart from the crowd. The beautiful 24k gold plate chalice has a satin finish on the cup, stem and base with a contrasting brushed gold finish on the node. The satin finish conceals fingerprints when handling, for beauty that lasts throughout the lengthiest of services. Alternative silver plate and sterling silver finishes are also available. A matching 175-host ciborium may be purchased at an additional charge.